Library of Auth0 React components. All the react-bootstrap components are re-exported inside this lib. You can find the API, see examples, and play with live editing of every component on the React Components section of our styleguide. The CSS bundles are also included on the packages installed via npm, but we encourage you to use it via our CDN so we all benefit from sharing the same url of the package to improve load time. Node.js v6.9.1 and npm v3.10.8 or newer is required. You can develop new components using React StoryBook. 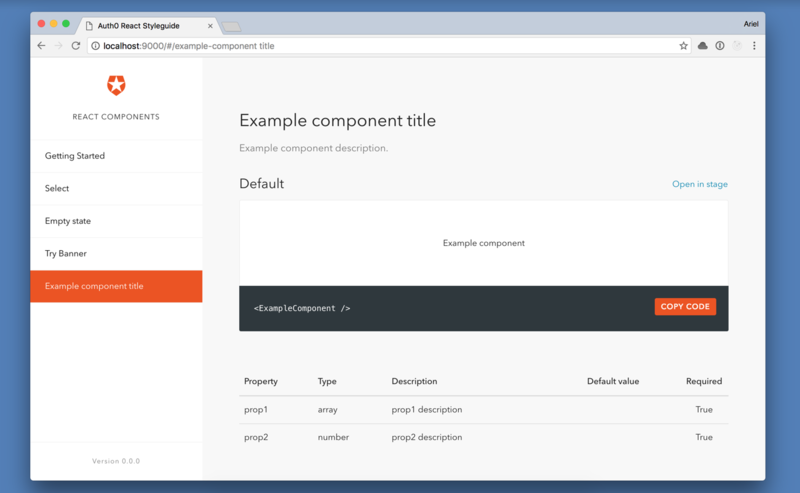 The index.js and examples.js files will be used to generate the React Styleguide page of the component, which will contain all the documentation for it (title, description, examples and table with properties information). Main component file, it should export the component. * Example component title: Example component description. The comment on top of the component definition will match with the page title and description, while the comments on top of the propTypes definitions will match with the definitions of the properties table. Export an array of objects representing the different examples of the component to showcase them in the Auth0 React Styleguide. Test your component using mocha, chai and enzyme. Add stories for your React component. You can check React StoryBook - Writing Stories for more information. Your components should be stateless functional components (they shouldn't contain state or lifecycle methods so we can use them with state management libraries like Redux). Add propTypes for all properties and add the proper comments so that information is shown in the Auth0 React Styleguide. Prefix your component css classes with its name so it doesn't conflict with others existing classes. Run the command bin/version <patch|minor|major|version-no> inside the root of this package. This will commit a new version for you. All the logos and branding are copyright Auth0 and may not be used or reproduced without explicit permission from Auth0 Inc. The icons are licensed from Budi Harto Tanrim. All other third-party components are subject to their own licenses.